The holiday season has finally arrived and online holiday shopping sales kicked off with a bang over the past holiday weekend. According to IBM’s analytics online retail sales were up double digit growth on both Black Friday and Cyber Monday compared to the same time last year. According to comScore, on Friday alone consumers spent $800 million online shopping which is a 29.3% increase over eCommerce Black Friday sales in 2010. Meanwhile, IBM’s online retail benchmark study found that online sales on Cyber Monday were up 33% compared to 2010. Merchants also saw a higher average order value up from $193.24 in 2010 to $198.26 for an increase of 2.6%. IBM found that online shopping peaked at 2:05pmEST. Throughout this past Cyber Monday, 10.8% of people used a mobile device to visit a retailer’s site (up from 3.9% in 2010) with mobile sales reaching 6.6% of online sales. This year shoppers were slightly influenced by social networks as shoppers referred from social networks generated 0.56 percent of all online sales on Cyber Monday versus 0.53 percent on Black Friday. 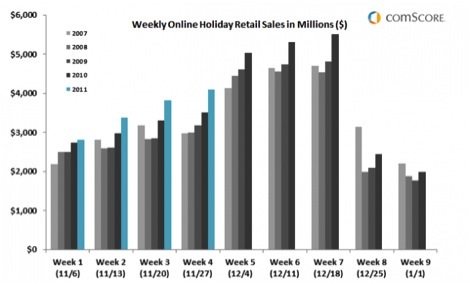 Holiday eCommerce sales are predicted to increase over the next few weeks. But we want to know how our store performed this holiday weekend? 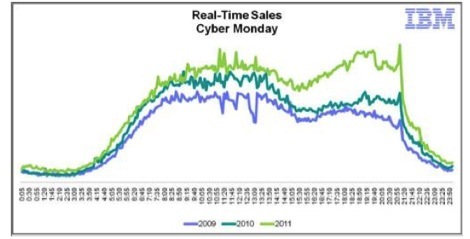 Did you see an increase in online shoppers on Cyber Monday compare to 2010? Let us know! Multichannel Order Manager provides your eCommerce business the tools and flexibility you need to successfully run your eCommerce store this holiday season. Check out our holiday tips and tricks webinar to learn how to streamline your business processes during your busiest time of year. This entry was posted on Wednesday, November 30th, 2011 at 12:20 pm	and is filed under Dydacomp News, Ecommerce, Industry News, Multichannel Order Manager, Webinar. You can follow any responses to this entry through the RSS 2.0 feed. You can skip to the end and leave a response. Pinging is currently not allowed.